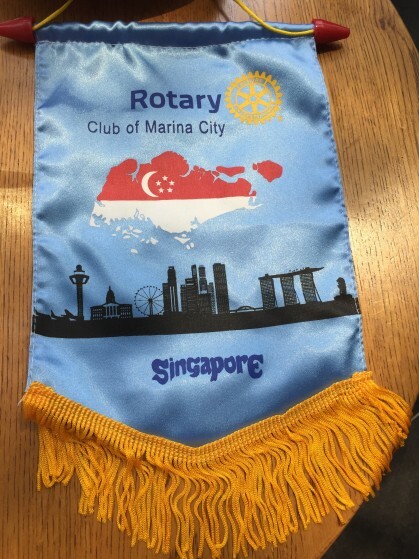 It happened as I was doing the Q&A after a speech I delivered at the Rotary Club of Singapore. I had been invited to speak about the job of being a speaker and I it such an interesting topic that I gladly accepted their invitation. So for once, I did not talk about a topic that interests me. Instead, the topic was about myself. It was a bit weird – but fun – to give a talk about being a speaker. I explained that the a great perk of my job is that just by being a speaker, you get access to so many interesting stories — stories that are often not well known. That’s when the revelation hit me. Or perhaps, I should say it in its plural form — “revelations”. Our job as speakers is not to collect stories to tell, but to select among the stories we have heard that which are good enough to be included in our speech. This means that we need to gather more stories than we are planning to tell. I do not have an exact number, but I would guess that it should be something like “100/10/1”. If we collect 100 stories, then 10 are good enough to be included in a speech, which means they are good enough to be written down and saved. And out of those 10 stories, we actually include 1 in our speeches. So in essence, our job is not to “collect stories” but to “discard stories” until we have just a few great ones left. Those great stories are the ones we tell our audience. As speakers, we are actually not “storytellers”. We are “story re-tellers”. We do not just tell stories, but we re-tell stories that other people have come to share with us either by approaching us after a speech, agreeing to do an interview with us for our research, or by contacting us online, and so on. Of course, this does not apply to the category of speakers whose speeches are built around their own life story like “climbing Mount Everest”, or “living without arms”, or “sharing my experiences as a Fortune 500 CEO”, etc. For the rest of us who speak on a general topic, I would say that nothing beats the stories that you receive from audience members after you have given your speech. Stories shared by people from the audience are close to their hearts because it is something about them or a close friend of theirs. When a person decides to approach you after your speech, it’s because they really want to share the wisdom of the story to more people. Most likely, an audience member who shares a story with you is not a celebrity who has exposure in mainstream media or the internet. Thus, their story which you will tell (or more aptly, “re-tell”) will sound fresh when you share them on stage. Since the person telling the story just heard your main message, my experience is that the stories you get right after a speech very often compliment the message that you have been trying to get across. Because the story is shared with you by a person who just heard you speak, you get a fresh perspective of your message that is from the point of view of another person. It usually helps to see your own topic with new eyes. And that is just what happened today. The man in the audience who asked me about “re-telling” stories helped me look at my own process of collecting, selecting and picking stories to tell in a new way. Lesson: Do not think that your job is just to “tell stories”. Instead, your job is to “re-tell” the stories that you come across as a speaker. Or to think in a metaphor, you are less of the “source of the river” and more of “the watering hole” where people who like your subject “go to drink”. I hope you understand what I mean. Less “YOU”. More “US”. Today, I delivered a speech as the only external speaker when Trendwatching (www.trendwatching.com) had their trend seminar. Trendwatching.com is an amazing company that collects trends from all over the world using 3000+ trend watchers. Their website offers an amazing number of free trends (and even more if you pay for it, of course). During the seminar today, they (the people from Trendwatching) presented some of the most interesting trends at the moment. I stayed for the whole day because I found it so fascinating to listen to them. And this post will be about an insight that hit me during the day. A common critique that speakers often get to hear is “most of the stuff presented during the conference/speech was not new”, or “I already know most of this stuff”. You see, I think that a conference where everything is about brand new insights for the audience would be very exhausting to listen to, and I actually doubt that you would be able to digest it all. A good speaker is supposed to move the audience to a new place – but in order to do that, you have to start where the audience is. Another way of saying it would be “you can not move someone from A to B without starting at A”. The trick to being a great speaker is that you are able to sense where the audience is (Point A) and then sense how far you can move them (Point B). Move them too little and the audience will feel that they did not learn anything. Move them too far and the audience will not understand what you are talking about. But that means that some parts of your speech need to include examples or descriptions that the audience is familiar with, to make them accept the world view that you are painting. They feel, “Oh, I agree with the speaker because I feel/think the same way”. Then you, as a speaker, can start moving them. Also, remember that the an audience will always consist of people who have different knowledge sets of the subject you are talking about. So, you have to speak to the “middle knowledge” of the room. This means that some people will already know what you are talking about, and some will have no clue. My insight from today was that a speech (or a whole conference) is successful if there is even just one new insight that you take away. There was, of course, many examples of trends that were presented which I already knew about: everything from Uber, to AirBnB and Spotify. The usual suspects, so to say. But then, there were many I have never heard of, and a few that really made me think. 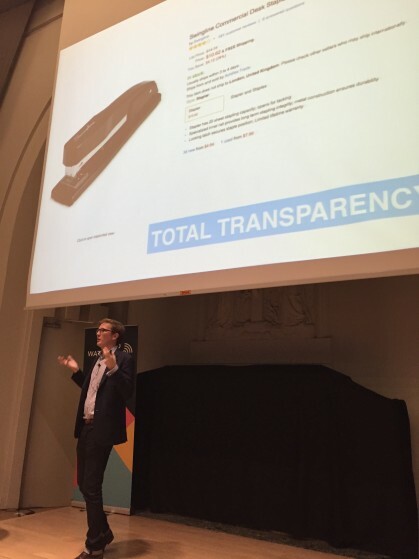 Like when Henry Manson from Trendwatching.com was talking about the trend of how the world is becoming increasingly transparent, and illustrated it with a product review of a stapler that had 581 (!) reviews on Amazon.com. Imagine, 581 people have taken the time to write down a review of a stapler — a $10 stapler! One good example like that can get your mind starting to think in brand new ways, or perhaps I should say that it got MY mind started. For others in the audience, that example meant nothing and instead, some other example from the day triggered new thoughts. And one example like that made it worthwhile to go to the whole conference for me. As long as I get one, or a few thing(s) to take home, I will be happy as an audience member. That was my takeaway today from the conference where I was a speaker. Lesson: As a speaker, you should aim at leaving the audience thinking thoughts they had never thought before to move their frame of reference. But structure your speech by presenting your material in a way that it feels familiar, yet new, to the audience. When they hear me reply: “I try to…“, they usually look so confused that I have to explain what I mean. Since this is a blog on speaking, I am assuming that the question of nervousness is high up on the list of topics that the readers of this blog want me to cover. You see, I believe that a great speaker should be a little bit nervous. True, the nervousness that comes from anxiety is perhaps not the best of feelings. But the nervousness that anticipation creates is great. It creates energy, tension, a touch of danger or vulnerability. A feeling that something is at stake. Very experienced speakers risk loosing this tension and go up on stage and just go through the motions, fall back on auto-pilot and get the speech over and done with. God, how boring to listen to! Give me a nervous speaker over that any day. A tightrope walker who is not feeling any nervousness at all when stepping up on the rope is probably walking 2 feet over the ground. That is not a very thrilling tightrope walk to watch. And the same is true for a speech: a speaker who feels nothing when he or she goes up on stage will probably not be very interesting to listen to. Or at least, it would be more interesting to listen to if the audience felt a bit of tension in the air. As a speaker who has done around 2000 speeches over the last 20+ years, I understand that I am at risk of falling into the trap of delivering bland speeches without a slight degree of nervousness, just because of the fact that I have done it so many times. It’s just like the risk of missing a dangerous spot if you drive on a road you have driven 100s of times before, because you relax too much thinking that you know what is going to happen as you drive through that familiar road. Since just walking up on a stage doesn’t make me nervous anymore, I artificially try to make myself more nervous. 1. I (almost every time I speak) move, or remove, one or two slides just minutes before I go on stage to make myself a bit uncertain in which order the slides are going to come. 2. I have been known to walk around backstage to create the feeling of nervousness in myself. I am not saying that you should copy my techniques, especially not if you are a new speaker who feels nervous just thinking about having to deliver your speech. The funny thing is that suddenly, once in a while – even after 20 years of doing this – I too feel nervous before going up on stage without having to do anything to create that feeling. Regardless of what we do to try to make ourselves a little bit anxious about how the delivery of our message will be received, just know that feeling anxious or nervous is a good one. Embrace that feeling. I once listened to a speech writer for Bill Clinton who revealed that one US President (I do not remember who it was anymore) reportedly drank too much water before delivering an important speech to make himself conscious about peeing himself (!) to create that feeling of tension in the air that comes from the right kind of nervousness. Lesson: Do not worry if you feel a little bit nervous when you are about to go up and give an important speech. Start to worry when you never feel nervous before a speech. Even if you are overwhelmed by a lot of nervousness, know that an audience will almost always try to mentally help you overcome it. 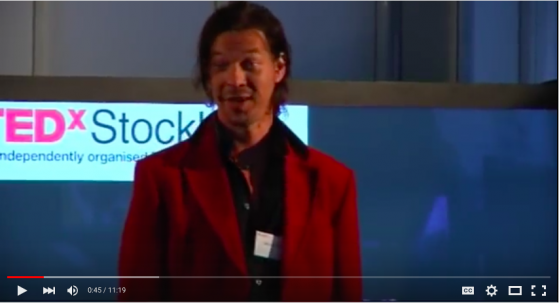 Just look at this video where Swedish poet Bob Hansson steps up on stage and admits that he is nervous. And notice how the audience reacts and embraces him, and the speech turns out great!